Fast moving consumer goods (FMCG) corporations are a predominant force behind the throwaway economic model driving the plastic pollution crisis. This report looks to determine the degree to which FMCG commitments, actions and performance are addressing the environmental and social impacts of their plastic packaging and waste. The plastic pollution crisis has become increasingly visible in recent years; shocking images of choked wildlife and piles of plastic waste in our communities and ecosystems have intensified public concern. Yet individuals might feel that it is almost impossible to avoid creating plastic waste, even when shopping for basic needs such as food. Whether we like it or not, the throwaway lifestyle is taking hold around the world – and most of the plastic packages that fill our bins and landfills, our communities, rivers and oceans come from large companies selling ‘fast-moving’ consumer goods. Forty percent of all plastics made in 2015 were used in packaging, the largest of all markets for plastics. 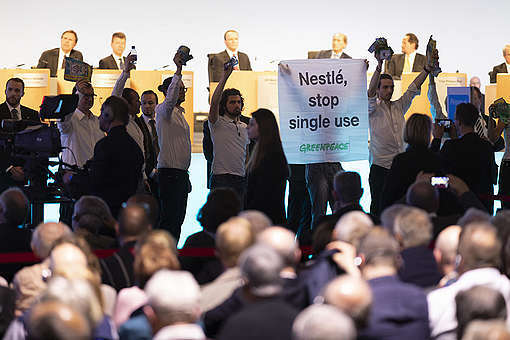 The promotion of branded products – food, drink, cosmetics and cleaners – in one-way packaging, is one of the drivers of mass production, over-consumption and is significantly contributing to the plastic pollution crisis. Found out more in our report here. Further information about the survey responses in our appendices here. Compliments, which I believe is Loblaws, Presidents Choice in Canada use many plastics that are not recyclable due to multi composites in the containers construction. Their frozen blue berries container I understand is a mixture of plastic and nylon and our recycle program in Cambridge On will not or can not recycle this. I have contacted Compliments regarding this and I am awaiting their decision as to what they are going to do. I pledge to keep lowering my use of plastic and tell local businesses that we need to reduce plastic. WE CANNOT WAIT TO RID OUR OCEANS OF PLASTICS. WE MUST STOP THE PRODUCTION, USE AND THROWAWAY HABITS OF PLASTIC USE. IF WE DO NOT, IT WILL NOT ONLY CONTINUE TO KILL OUR MARINE LIFE, BUT DAMAGE OUR OWN LIVES AT INCREASING NUMBERS. This HAS to stop. I've watched and been mindful of all packaging go from bio degradable papers and cardboards to earth killing plastics in a short 20 years. From laundry soaps, take out, meat trays, even the little fruit labels.....paper to plastic. IT DOESNT GO ANYWHERE IN THE EARTH PEOPLE!! Your purchase is a vote. Unpack your purchase, leave the packaging at the place of purchase, I do. Choose cardboard and paper packaging when there is a choice.....put these corporate evil monkeys out of business. Also demand laws from our leaders on this as well. All these companies are dispicible!!! All they care about is the all mighty dollar! It makes me sick! Greenpeace is necessary for a good reason: all animals are of value in the chain of life. Damage to one affects all others. Please do the right thing and support Greenpeace and its desperate need. Please be the first to step up and leave a legacy your children can be proud of. What do you you have for teachers to use in their classrooms? Global warming, the arms race, environmental destruction, pollution, overpopulation, we just can't win. I feel like a Titanic passenger. It's time to look at the future with a steely gaze. I keep reading that global warming will doom us, if we don't act by (name your year). It's already happening. It's out of control. It is sickening that the name of the game is GREED! More money to be made by not caring about the planet and future generations! And a president that condones it all. "individuals might feel that it is almost impossible to avoid creating plastic waste, even when shopping for basic needs such as food", yes indeed. But isn't the real issue that the manufacturers of the greatest level of waste, eg plastic one use drinking bottles, have no responsibility but surely they should be made to? Is GP looking towards something to move this closer to a reality? Thanks a lot for your comment, Wendy. You're absolutely right, corporations and manufacturers need to be taking responsibility for the production of single-use plastics, rather than expecting that recycling will solve the problem. I am aware of the ocean plastics problem world wide, and in rubbish sites, but I have not heard about the Greenpeace campaigns on plastic. I saw on local Birmingham tv news channel featuring charity PlasicOcean UK. And so I searched for more. Are Bioplasic sugar cane polythene materials a suitable intermediate measure? How much is the Greenpeace annual subscription, I was a member in 1990s. Hi Jackie, thanks for your comment. 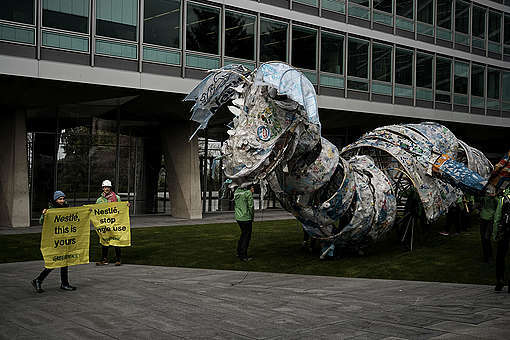 You can learn more about our campaign to end single-use plastic pollution here: https://www.greenpeace.org/international/act/lets-end-the-age-of-plastic/. We are pushing for companies to switch to reusable materials rather than bioplastics; we don't want to simply switch from one throwaway material to another! If you're interested in becoming a donor, we suggest you check out these options with Greenpeace UK: https://secure.greenpeace.org.uk/page/contribute/greenpeace-main?source=wb⊂source=6E153. Thank you for your support!